"Become a professional footballer on your Android!" Game Goal: Choose a player to start your football career. You will need to do tests to enter a team and attempt to move on to bigger and bigger clubs. How to Play: You need to overcome different levels in which you must pass the ball or score goals in order to move to the next challenge. You can earn tickets and spend them to rewind matches and correct errors. Controls: The game is controlled via touch screen. Just swipe to another player if you want to pass him a ball or towards the keeper if you want to score a goal. Developer: First Touch is based in United Kingdom	- Android-Market-trusted developer. Rating: The TOP 1 Most popular games in Free Kick Games category. Ranking: The TOP 1 Most downloaded games in Free Kick Games category. Ideal for fans of football games. You can become a professional player. 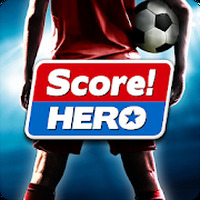 Do you like Score! Hero?